#GivingTuesday is November 27! Want to know how you can support the work we do here at the UC Statewide Integrated Pest Management Program to help you understand and control pests around your home and landscape? Your gift will further UC IPM's mission to help California residents, growers, land managers and other professional pest managers prevent and solve pest problems with minimal impact on people and the environment by developing and promoting the use of integrated and ecologically sound pest management programs. Did we say someone would eat a bug? UC IPM Director Jim Farrar has committed to eating a pest (maybe an insect-- we don't know yet) if at least 20 people make a donation of $10 or more to UC IPM. With your donation and Jim's appetite, there will be one less pest to deal with! Spread the word to colleagues, family and friends to help UC IPM meet this goal. 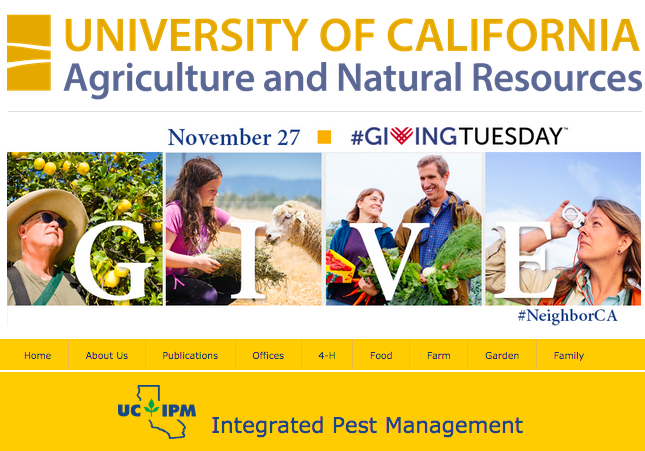 All UC IPM donors will be invited to the special pest eating event which will take place in the afternoon on Wednesday Nov. 28 in the UC ANR building in Davis! Please donate today! And thank you for all your support!